Visit the Commonwealth War Graves Commission web site. The Cambrian Railways operated over a large area of mid and north-east Wales and north-west Shropshire in England, with the company headquarters in the town of Oswestry, Shropshire. The company emerged in the late 1850s, from an amalgamation of a number of smaller railways, and continued operating until 1 January 1922 when it was absorbed by the Great Western Railway. The memorial, by sculptor Allen G Wyon, features a statue of a draped female figure with outstretched arms. Behind the figure is a marble tablet with a rising sun motif. It includes the names of 53 employees of the company who died. 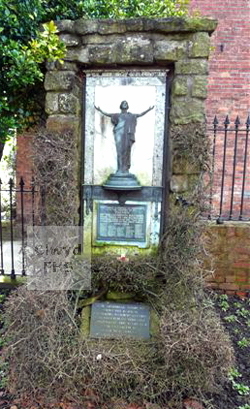 It was erected at Oswestry Station and was unveiled on 1st January 1924 and was moved to its present site in Cae Glas Park, Church Street, Oswestry in 1975. 95641 251st Tunnelling Coy., Royal Engineers 29 May 1916 28 Son of Wallace & Mary Boak, of Wrexham; husband of Eva McCoy (formerly Boak) of 31, Crescent Avenue, Stoke, Coventry. Fireman. Also named on the Acton (no monument) and Wrexham War Memorials. Cambrin Military Cemetery, Pas de Calais, France. 65152 18th Bn. Welsh Regiment 13 Apr 1918 19 Youngest son of Mary Emma Thomas (formerly Boylin) of 3, St. Johns Hill, Ellesmere & the late William Boylin. Booking Clerk. Ploegsteert Memorial, Hainaut, Belgium. 2202 6th Bn. Welsh Regiment 18 Feb 1916 20 Son of Patrick and Eliza Caine, 35 Phillip Street, Swansea (1911 Wales Census). Goods Porter. St Patrick's Cemetery, Loos, Pas de Calais, France. 7078 6th Bn. King's Shropshire Light Infantry 13 Jun 1918 32 Son of Mary Collings, 5 Bay Cottages, Middleton Road, Oswestry (1911 England Census). Labourer. Aubigny Communal Cemetery Extension, Pas de Calais, France. 69737 2nd Bn. London Regiment (Royal Fusiliers) 21 Mar 1918 29 Son of Emma Jane Coole, of 41, Ferrers Road, Oswestry & the late John Parry Coole. Goods Clerk. Pozieres Memorial, Somme, France. 61305 17th Bn. Royal Welsh Fusiliers 1 Sep 1918 20 Son of John Thomas and Gwen Lloyd Cudworth, 22 Snowdon View, Machynlleth (1911 Wales Census). Cleaner. Vis-en-Artois Memorial, Pas de Calais, France. Davies 7th Bn. South Wales Borderers 22 Sep 1918 33 Son of Joseph and Ruth Davies, 1 Vine Cottages, Trinity Street, Oswestry. Clerk. Doiran Memorial, Greece. 19521 6th Bn. King's Shropshire Light Infantry 22 Mar 1918 21 Son of Miriam Downs, of 4, Park Green, Oswestry, & the late Stephen Downs. Platelayer. Poziers Memorial, Somme, France. 257074 96th Light Railway Operating Coy., Royal Engineers 30 Dec 1917 21 Son of William and Elizabeth Dyas, Rock House, Bausley Hill, Ford, Shrewsbury (1911 England Census). Cleaner. Chatby Memorial, Egypt. 230341 10th Bn. King's Shropshire Light Infantry 30 Nov 1917 22 Son of Richard & Elizabeth Ellis, of 2, Church Lane, Selattyn, Oswestry. Labourer. Jerusalem War Cemetery, Israel. 58408 25th Bn. Royal Welsh Fusiliers 18 Sep 1918 19 Goods Clerk. Ronssoy Communal Cemetery, Somme, France. 8589 1st Bn. Royal Welsh Fusiliers 23 Aug 1915 Son of John Evans. Le Touret Memorial, Pas de Calais, France. 39757 2nd Bn. South Wales Borderers 31 Dec 1917 24 Son of Isaac Evans, of Tonfanau Crossing; husband of Catherine Ann Evans, of Tonfanau Crossing, Tywyn, Merionethshire. Relayer. St. Sever Cemetery Extension, Rouen, Seine-Maritime, France. 235410 14th Bn. Royal Welsh Fusiliers 4 Aug 1917 39 Son of Hugh & Ann Evans, of Machynlleth, Montgomeryshire; husband of Violet Roselle Evans, of The Sycamores, Dolau, Radnorshire. Station Master. Menin Gate Memorial, Ieper, West-Vlaanderen, Belgium. 36024 1st/10th Bn. King's (Liverpool Regiment) 9 Apr 1918 19 Son of Mr & Mrs Ralph Evans, of The Old White Lion Inn, Oswestry. Clerk. Loos Memorial, Pas de Calais, France. 15694 7th Bn. King's Shropshire Light Infantry 13 May 1917 Nephew of N. Harris, of Yew Tree Cottage, Morton Common, Oswestry. Etaples Military Cemetery, Pas de Calais, France. 11150 2nd Bn. Gordon Highlanders 1 Oct 1915 Son of John & Martha Evans, late of Oswestry; husband of Alice Evans, of 19, Rothwell Street, South Shore, Blackpool. Abbeville Communal Cemetery, Somme, France. 27226, 4/21720 King's Shropshire Light Infantry (7th Bn.) formerly 4/21720 Training Reserve (T.R.) Bn. 24 or 26 Mar 1918 19 Son of Robert William and Catherine Foulkes, 5 Marine Drive, Barmouth (1911 Wales Census). Signal Porter. Wailly Orchard Cemetery, Pas de Calais, France. 33246 10th Bn. King's Shropshire Light Infantry 22 Aug 1918 22 Adopted son of A Jones, of Farchoel Cottage, Pool Quay, Welshpool, Mongomeryshire. Merville Communal Cemetery Extension, Nord, France. Harries 'D' Coy. 1st/7th Bn. Royal Welsh Fusiliers. 17 Aug 1915 22 Son of Thomas Davies & Annette Martha Harries, of Grosvenor House, Aberystwyth, Cardiganshire. Engineer Pupil. East Mudros Military Cemetery, Lemnos, Greece. Hughes 14th Bn. Welsh Regiment 30 Aug 1918 22 Son of John Hughes, of Llwyn y Mapsis, Morda, Oswestry. Apprentice Fitter. Morval British Cemetery, Pas de Calais, France. 60748 14th Bn. Welsh Regiment 23 Apr 1918 Warloy-Ballion Communal Cemetery Extension, Somme, France. 150584 126th Siege Bty. Royal Garrison Artillery 16 Nov 1917 19 Son of Mrs Martha Jones, of Plas Spa Terrace, Llanfyllin, Montgomeryshire. Llanfyllin Cemetery. 33082 6th Bn. King's Shropshire Light Infantry 12 Aug 1917 34 Son of John & Ann Jones, of Oswestry; husband of Mary Elizabeth Davies (formerly Jones), of Holm Leigh Cottage, Hengoed, Oswestry. Warehouseman. Also named on the Gobowen War Memorial. Canada Farm Cemetery, Ieper, West-Vlaanderen, Belgium. 200208 1st/4th Bn. King's Shropshire Light Infantry 19 Apr 1918 22 Son of John & Eliza Jones, of 54, Llwyn Road, Oswestry. Apprentice Fitter. Tyne Cot Memorial, Ieper, West Vlaanderen, Belgium. 12260 6th Bn. King's Shropshire Light Infantry 30 Aug 1916 26 Son of Mr & Mrs William Jones, of Chapel House, Race Course, Oswestry. Porter Thiepval Memorial, Somme, France. 17061 5th Bn. King's Shropshire Light Infantry 24 Aug 1916 20 Son of the late Frederick & Louisa Judge. Boilersmith. Thiepval Memorial, Somme, France. 12268 6th Bn. King's Shropshire Light Infantry 31 Dec 1915 21 Son of William & Elizabeth Lewis, of 21, Prince Street, Oswestry. Apprentice Joiner. Estaires Communal Cemetery, Nord, France. 17241 14th Bn. Welsh Regiment 10 Jul 1916 21 Son of John and Jane Lloyd, 57 Bryninhn? Street, Swansea (1911 Wales Census). Platelayer. Thiepval Memorial, Somme, France. 16926 1st Bn. King's Shropshire Light Infantry 9 Oct 1916 35 Husband of Alice Loose, Workington Cottage, Oswestry (1911 England Census). Tarpaulin Sheet Maker. Thiepval Memorial, Somme, France. 8118 1st Bn. Herefordshire Regiment 18 Aug 1915 23 Son of George and Maria Mason, Brickyard Cottage, Newbridge-on-Wye. (1911 Wales Census). Platelayer. East Mudros Military Cemetery, Lemnos, Greece. 8209 1st B. Herefordshire Regiment 19 Aug 1915 25 Son of Mr C & Mrs S Mills, of 29, Middleton Road, Oswestry. Booking Clerk. Azmak Cemetery, Suvla, Turkey. 291868 6th Bn. Welsh Regiment 1 Oct 1918 20 Son of Francis Thomas & Jane Newell; husband of Dorothy A Newell, of Barmouth Junction, Arthog, Dolgellau, Merionethshire. Booking Clerk. Berthaucourt Communal Cemetery, Pontru, Aisne, France. 275900 Railway Operating Division, Royal Engineers 24 May 1918 24 Son of John & Jane E. Nicholas, of New House, Caersws, Montgomeryshire. Cleaner. Les Baraques Military Cemetery, Sangatte, Pas de Calais, France. 33256 10th Bn. King's Shropshire Light Infantry 18 Sep 1918 26 Son of Edward and Louisa Owen, St. Mary's Place, Welshpool (1901 Wales Census). Goods Porter. Vis-en-Artois Memorial, Pas de Calais, France. 53765 16th Bn. Royal Welsh Fusiliers 22 Apr 1918 Blacksmith. Pozieres Memorial, Somme, France. 290052 1st/7th Bn. Royal Welsh Fusiliers 28 Nov 1916 25 Son of John and Ann Owen, Dovey View, Machynlleth (1891 Wales Census). Cleaner. Baghdad North Gate Cemetery, Iraq. 11801 6th Bn. King's Shropshire Light Infantry 7 Jan 1917 23 Son of Edward & Jemimah Phillips, of Whittington. Goods Clerk. Whittington Cemetery. 60779 15th Bn. Welsh Regiment 27 Oct 1918 20 Son of Edward Price, of Level Crossing, Dyffryn, Merionethshire. Forest Communal Cemetery, Nord, France. 12294 6th Bn. King's Shropshire Light Infantry 17 Jun 1916 25 Son of Mrs Mary Jones, of 13, Orchard Street, Oswestry; husband of Mary Roberts, of Oswestry. Assistant Boilersmith. Oswestry General Cemetery. 42201 10th Bn. South Wales Borderers 12 Sep 1918 23 Son of Evan & Sarah Roberts, of 45, Park Avenue, Oswestry. Porter. Gouzeaucourt New British Cemetery, Nord, France. G/23861 'B' Coy. 4th Bn. Royal Sussex Regiment 28 Sep 1918 18 Son of Martha Rodgers, of Bradenheath, Whitchurch, & the late John Rodgers. Goods Clerk. Also named on the Welshampton War Memorial. Tyne Cot Memorial, Ieper, West-Vlaanderen, Belgium. 12269 6th Bn. King's Shropshire Light Infantry 23 Mar 1918 23 Son of Alfred & Mary Hannah Smith; husband of Annie Smith, of 31, Lloyd Street, Oswestry. Born Bakewell, Derbyshire. Apprentice Painter. Ham British Cemetery, Muille-Villette, Somme, France. 61307 15th Bn. Royal Welsh Fusiliers 27 Jul 1917 21 Son of Griffith & Ellen Thomas, of 25, Wesley Terrace, Machynlleth, Montgomeryshire. Cleaner. Menin Gate Memorial, Ieper, West-Vlaanderen, Belgium. 718 4th Bn. King's Shropshire Light Infantry 14 Dec 1914 49 Husband of Sarah Jane Tudor, 1 Middleton Road, Oswestry (1911 England Census). Labourer. Rangoon War Cemetery, Burma. 200077 1st/4th Bn. King's Shropshire Light Infantry 28 Dec 1917 26 Son of Laura Vaughan, 4 Swan Crescent, Oswestry (1911 England Census). Labourer. Thiepval Memorial, Somme, France. 43804 8th Bn. Manchester Regiment 23 Apr 1917 20 Son of John William & Sarah Ann Wainwright, of 29, Gloucester Street, Atherton, Manchester. Cuckoo Passage Cemetery, Heninel, Pas de Calais, France. 266133 5th Bn. Royal Welsh Fusiliers 26 Mar 1917 30 Son of Thomas Harper White, of Bryn Meirion, New Street, Pwllheli, Caernarfonshire; husband of Emily Elizabeth White, of 63 Willow Street, Oswestry. Booking Clerk. Jeruslaem Memorial, Israel. 26409 7th Bn. King's Shropshire Light Infantry 22 Mar 1918 19 Son of Mr & Mrs George Williams, of 45, Orchard Street, Oswestry. Porter. Bac-du-Sud British Cemetery, Bailleulval, Pas de Calais, France. 1158 7th Battalion, Royal Welsh Fusiliers 10 Aug 1915 23 Son of Florence Annie Reed (formerly Williams) of 3, Ashfield Terrace, Llanymynech, Montgomeryshire, & the late Richard Williams. Goods Clerk. Helles Memorial, Turkey. All information is provided in good faith but, on occasions, errors may occur. The Clwyd Family History Society does not accept responsibility for the consequences of using any of the information provided on this page.